Extremely lightweight but strong. Weighs just .25 lb. 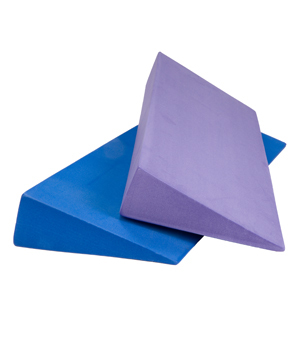 20" x 2" x 6.5"
Designed to help you get an extra edge in your postures, our Foam Yoga Wedge is a prop you'll use frequently. Place it under your heals in a standing forward bend or use it instead of a block to support your bent leg in pigeon pose. This 20" long foam wedge is super lightweight --just a quarter of a pound! The yoga wedge is a very versatile tool that can be used in many different ways to add support and length for many different postures. For example, the wedge can be placed under your heels, sit bones, or knees when practicing forward-bending poses to make it easier to place your hands flat on the floor without compromising correct form and posture. Our high-density foam yoga wedges are made of non-toxic eco scratch-resistant EVA foam . They are durable, lightweight, individually wrapped, and come in your choice of either blue or purple. I have tried the wedge for a few stretching sessions. It feels like a deeper and better stretch then I have had without one. I definitely recommend it. These wedges are great to use as support for people who may not have the flexibility to sit up on their sit bones. The surface is a bit slippery if using them under your hands in plank position for clients who have sore wrists. Lots of options for using the wedges. I have long legs and this comes in handy to help support me in boat pose. Just what I needed to help strengthen up my hip muscles again. Nice product and good service! Love the product. Just what I hoped for. Love the material & angle of the wedge!! It is perfect for helping our patients maintain a neutral spine when first learning how to engage their abdominals. Its also a must for anyone new to a pilates class. my students love these! i bought enough so i would have extras for future classes. this is the best price on the internet by the way. everyone else wants 15 bucks plus shipping! I purchased this for a student with Osteo Arthritis. She places it under her hands to extend the angle of the wrist in weight bearing poses. A great help and comfort her that allows her to stay in poses for longer periods of time. Great quality and prompt service!